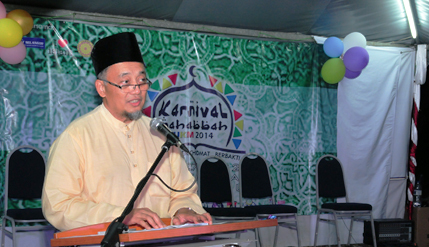 BANGI, 3 April 2014 – The National University of Malaysia (UKM) students’ organisations have been urged to organise more moral and religious themed events to hep imbue good values among their members. Speaking when closing the Mahabbah Carnival 2014 organised by the Faculty of Islamic Studies (FPI), held at the parking lot of the UKM Mosque here last Thursday, Deputy Vice Chancellor (Academic and International Affairs) Prof Ir Dr Riza Atiq Abdullah OK Rahmat congratulated the students and staff of the faculty for being active in organising such events. “The students from this faculty have achieved much. You have proven in the last few years that FPI students can compete and be active just like students from the other faculties. Events like the carnival shows that FPI students can do more than just read books; you too can have fun,” Prof Riza Atiq said. He said there was always the perception that FPI students could only organise serious academic events and not carnivals or party-themed events. “This carnival shows your creativity and passion for your faculty and your respective courses. It reflects your belief that you can organise events that are crowd pleasing and attractive to people without being overly western or compromising Islamic values. Islamic events can also attract the masses”, Prof Riza Atiq said. He hoped that FPI students will continue to make the Mahabbah Carnival an annual event so that other students may benefit from it as well. The carnival apart from having students from different departments and courses of FPI running stalls selling fizzy drinks, fried snacks among others and even faculty memorabilia like mugs and badges was also filled with fun-filled games such as archery and congkak, as well as the Nasyid competition.